The Salomon S-LAB Wings is a shoe update and a complete evolution of the S-LAB XT Wings line. I ran and hiked in a pair of the S-LAB XT Wings 5 and 6 and really liked them. I found them to be incredibly stable, durable, lightweight, and very protective. I was excited and anxious when I saw that Salomon decided to move in a new direction with the S-LAB Wings line for this new iteration of the shoe. The spirit of the old S-LAB XT is noticeable, but it seems that the Salomon Sense Ultra (and it’s popularity/success) has had much more of an influence on this shoe. In previous versions, I felt like I was putting on the same feeling shoe with each update. Not so this time around, the S-LAB Wings is a radically redesigned piece of footwear. I think most people will really like this shoe and the changes that were made. Salomon uses an airy and breathable material to construct the upper of the S-LAB Wings that feels great on the foot. This is the kind of shoe that can be worn with thin socks or sockless without a problem. For structure and support on the upper, the shoe has Sensi-Fit welded overlays. This Sensi-Fit technology is something Salomon uses in almost all of their shoes, and is a feature I really like for keeping my midfoot snug and tied down. This shoe also uses a welded overlay for the toe protection, which appears to be very sturdy. The heel counter is solid, but not as rigid as the old S-LAB XT line. The one area of the upper that I’m slightly disappointed with is the toe box. It’s not only narrow, but also low volume. I wear a 12.5 in almost all of my trail running shoes, and the 12.5 feels pretty constricting. This is a pretty big blow for me, because this is the first time Salomon has sold these shoes in a size larger than 12. The fit and feel of the 12.5 in these, is similar to the size 12 of the old S-LAB XT series. I could try a size 13, but I think the shoe would fit way too long, and that wouldn’t address the low volume in the toebox. I know a lot of people like a secure and snug fit, but I prefer it looser and a more natural foot shaped toebox with more vertical volume. ***Update*** I exchanged the 12.5 for a size 13 and the fit is much better. These run a little small, so you may want to order a half size up. I love that Salomon is now using their Endo-fit technology in this shoe, as I really love the way it holds my foot down with comfort in the XA Pro 3D and Mantra. For those of you not familiar, Endo-fit is a socklike bootie on the inside of the shoe that wraps the midfoot. I’ve found this to assist in keeping my food stable and secure, and also reduce any friction points through the midfoot. The midsole of the S-LAB wings is where Salomon has made one of the biggest changes. I should have mentioned this earlier, but this shoe is light! I think a lot of the change in weight comes from the changes Salmon made by removing the plastic 3D chassis found in the S-LAB XT series. You can still find the 3D chassis on the XA Pro 3D and the Wings Pro, but it is gone from this shoe. Instead, Salomon has gone with a purely foam midsole this time (injected and molded EVA). The foam used is firm like the XA PRO 3D, but it feels about 40% more plush underfoot. Removing the plastic 3D chassis has improved the flex and toe off, and has also limited the torsional rigidity. The S-LAB wings has a 9mm drop with a 28mm heel and 19mm forefoot. The flaring of the heel has also been tapered down a bit with the S-LAB wings, although it feels like it will still offer a great deal of rearfoot stability. Stability has been a staple of Salomon’s mountain line of running shoes. There is a pronounced arch support in the XA Pro 3D, Wings Pro, and the old S-LAB XT lineup. It’s completely gone from this shoe. Different runners and hikers will view that as positive or negative, but it is a big change as the footbed feels completely flat. The outsole for the S-LAB Wings has been completely redesigned. The S-LAB XT line used a series of small chevrons lugs (larger chevrons on the soft-ground version) that I found to be great for traction, but susceptible to breaking off on bomber downhills. This new outsole design looks really great for all kinds of dry trail conditions. (**There is also a soft ground version of this new S-LAB WIngs shoe with an outsole more suited for wet and muddy conditions. **) Salomon uses a series of Contra-grip rubber and trapezoidal lugs to give great coverage of this outsole. For rock protection, the S-LAB Wings uses Salomon’s tried and true Pro-feel film in the forefoot to protect from rocks and other sharp objects. I’ve done a lot of running in my Salomon Sense Mantra, and really like the protection offered by such a light and flexible piece of technology. As you can see, Salomon has made a lot of great changes and introduced a lot of technology to the S-LAB Wings. I think most of the changes are positive, as this shoe has finally been redesigned to stand apart from it’s cousin, the Salomon Wings Pro. In previous years, the only difference between the S-LAB XT line and the Wings line was that the S-LAB line was made of lighter materials. Now, the shoes are completely different. Runners and hikers who love the Salmon Sense Ultra, but need a little more underfoot are going to love this shoe. 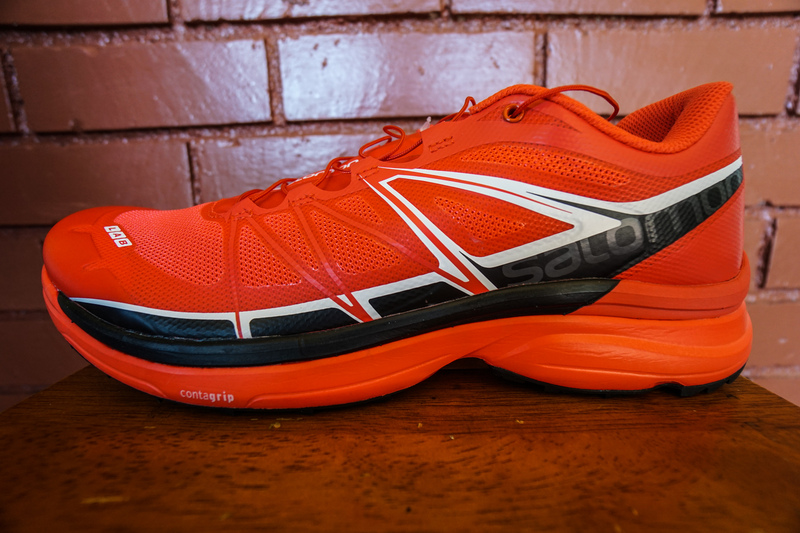 Runners and hikers who loved the old S-LAB XT, might have a few issues with the changes. Luckily, they (we) still have the Wings Pro. This shoe is definitely worth trying on, and I think it is going to be a home run for a lot of people. Thanks for the pics. Especiaaly the one where you show the bootie. No problem, I’m glad you found them useful! I love the Speedcross 3’s – and found the Sense Ultra 3 SG’s a bit too light and lacking in cushioning underfoot, how would you say these stack up against those two? Stu, the Wings is a much more substantial shoe than the Ultra. There is more cushion underfoot, and the shoe has a wider platform overall. If you liked the Speedcross 3, you’ll probably enjoy the S-Lab Wings as well. There is a similar fit and feel to both shoes. All my friends and my S-Wings’ insole have the same issue during in wet condition, it can be resolved by switching your old Salomon insole. Its Quicklace has to manually tighten the front rope first for an additional step. And the size has to buy extra large 1/2 than other Salomon shoes. Other than those comments, it’s really good. I like the Salomon shoes so much! Are They good anderpronator shoes? They’re a pretty neutral shoe without much in the way of pronation support. If you have wide feet, the SLAB Wings probably won’t be a good fit. The width is on the narrower side.